Anyone who’s been exposed to me online or in person since roughly November of 2015 knows that I’m obsessed with Lin-Manuel Miranda’s hit Broadway phenomenon Hamilton. Among its endlessly numerable felicities is the fact that it’s a love letter to the written word—as evidenced by the refrain, embraced by deadline-ridden writers everywhere, of writing like you’re running out of time. In that spirit—of writing this column wondering how on Earth we’re almost at the year’s halfway mark—I’ve decided to focus on a few books where time is really foregrounded: as antagonist; as means; as theme. 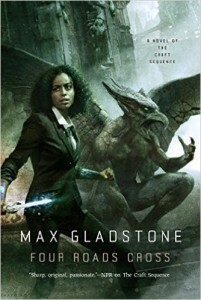 Time is of peculiar concern to Max Gladstone’s Craft Sequence mosaic: It’s a meta-tool for curating the series’ tension from book to book. In Two Serpents Rise, our protagonist, Caleb, is covered in ritual scars that we learn were inflicted on him in childhood; two books later we’re twenty years earlier in Last First Snow, and our protagonist is Temoc, Caleb’s father. Even though we know it has to end with him mutilating his son, we spend the whole book in a teeth-gritting haze of hoping it will somehow be otherwise. Four Roads Cross is a direct sequel to the first book in the series, Three Parts Dead—meaning we return to Tara in Alt Coulumb, struggling to maintain fire god Kos’ solvency in the face of accusations that his love for the recently resurrected moon goddess Seril is an undisclosed liability. At stake is the well-being of Tara’s adopted city and the friends she’s made there: Cat, who’s struggling to maintain boundaries with her new-found goddess; Raz, a vampire-pirate who’s struggling to maintain boundaries with Cat; and Abelard, a priest who’s struggling against being turned into a saint. Meanwhile ghosts from Tara’s past enter the machine of global capital and threaten to bring the sky down around her. If anything has thus far marked the Craft Sequence for me besides the engaging characters and infuriating intelligence of its scheme, it’s pace: Each book has had something of the relentless to it, a narrative clock ticking inexorably down while plot gears align and interlock. Four Roads Cross is no exception—it’s exhilarating, action-packed, and beautifully structured—but it also features some of the most moving and quietly heart-breaking writing I’ve seen from Gladstone yet. Overall it’s breathtakingly satisfying, and leaves dangling some intriguing threads that will no doubt be tugged into unravelling future books in the sequence. Canada is often described as a mosaic, sometimes a patchwork. I would add that it might also be described as a great lumbering automaton; it is an absurdly large mass, a construct made of widely different cogs and gears that sometimes work together and sometimes don’t, that is physically connected by the railroad—one of the great embodiments of the power, ingenuity, and crushing ruthlessness of the steam age. It is a perfect setting for steampunk. 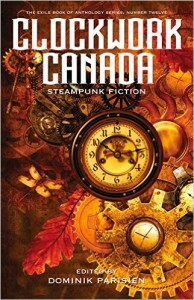 It’s an enormously diverse collection, both in terms of its authors’ backgrounds and interests and the eclecticism of its contents: These are stories that span the breadth (and occasionally, literally, depth) of Canada, geographically and temporally, as well as the whole spectrum of steampunk. There’s a good mix of adventure stories and domestic stories, some more hopeful, some more horror; some are more fantastic, some more science fictional. Some stories imagine alternate histories, while others nestle small, beautiful stories in the corners of enormous events; some do both, and more, tangling retro and futurism in different measures. As with any anthology, some stories are more successful than others; a few of the stand-outs for me were Charlotte Ashley’s wonderful “La Clochemar,” Claire Humphrey’s moving “Crew 255,” and Rati Mehrotra’s brilliantly uplifting “Komagata Maru.” But my favourite of the whole is Terri Favro’s “Let Slip the Sluicegates of War, Hydro-Girl,” which sets out to do roughly a million things and pulls them all off—not least of which is tearing down the image of a beloved Canadian icon and rebuilding it into something very, very different. An excellent showcase for new and established Canadian voices as well as for Parisien’s editorial skill, Clockwork Canada’s a fascinating, faceted read that I thoroughly enjoyed. 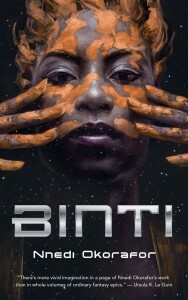 One of the novellas that launched Tor.com’s new publishing arm last year, Nnedi Okorafor’s Binti is collecting accolades, among them a Nebula nomination—and I wouldn’t be at all surprised if it went on to gain a Hugo nomination as well, as I write this in the last days of the nominating period. This is a startling whirlwind of a book that engaged and entranced me, and then left me arguing back and forth with myself over what I thought it had done. In a far-future world somewhat aslant our own, Binti Ekeopara Zuzu Dambu Kaipka of Namib is a brilliant mathematician who’s been accepted into Oomza University, a prestigious multi-species school light years away from Earth with a minority of human students—all of whom belong to Earth’s dominant ethnicity, the Khoush. Binti is Himba—a real ethnicity in our world—and would be the first of her people to attend the university. Her family is set against her going, and we quickly see why: Outside her own community Binti is sneered at, exoticised, with Khoush people tugging at her hair and the fragrant cosmetic otjize mud worked into it. This treatment takes on a more genteel cast once she’s on a ship bound for the university—and then Okorafor pulls the rug out from under the coming-of-age space-Hogwarts story I had been expecting, as aliens called the Meduse invade the ship and massacre everyone on board except Binti. This turn is what has me thinking about time in relation to the story, and reflecting on Jo Walton’s assertion that pace is what defines genre far more than tropes. From the massacre on, the story’s stakes skyrocket into thriller-mode, as the focus is on Binti’s survival, her attempts to communicate with her captors, and her moving into a position of mediation between them and their enemies. Time speeds up and slows down. The traits that made Binti an object of scorn to the Khoush on Earth and an object of study on board a ship full of students are the same traits that save her among the Meduse—but in a limited, complicated way that is partly the catalyst for my perpetual argument with myself over whether or not I am convinced by the things this book does. My arguments with myself go as follow: I can’t believe how quickly the massacre is glossed over. But Amal, I reply, massacres are glossed over in the real world all the time. Sure, I concede, but shouldn’t it have had more of an impact on Binti? Well, should it, I ask, when this is a first-person narrative from a young woman stating, claiming, and maintaining her identity in the face of repeated trauma? Hmm, I muse, I suppose it’s weird to expect some kind of consensus on how an individual ought to experience or represent her trauma—that might actually be like faulting this book for not being what it seemed like it was going to be in the first place. Which would be silly. Hmm, I muse further, and think on it more, and have no conclusion except that Okorafor has written a very rich, very deliberately uncomfortable and destabilizing story that can support any number of readings and arguments before tilting sideways to tip them all out an airlock. I highly recommend Vajra Chandrasekera’s review in the March 2016 Strange Horizons, which relates some of the historical and present-day contexts surrounding Namibia and the representation of Binti and the Himba people in the story, and delves much deeper into the text. For myself, I’m still turning the book over and over in my head’s hands, like the mysterious edan artifact in Binti’s possession, wondering if it does any of the things I think it does, but mostly wondering at and grateful for its existence.